If you were a local dog whose owners were staying home over the long holiday week and happened to be in downtown Menlo Park today, you were one lucky dog. 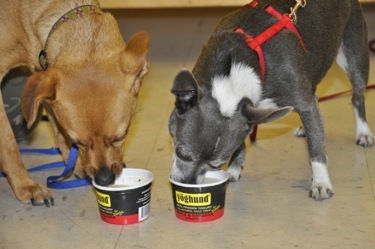 Lynn Macy, owner of The Pet Place, was dispensing frozen yogurt, a perfect summer treat for hot dogs. The Australian Shepherd Winston slurpped his Yoghund on the sidewalk in front of the store while Hector and Bella enjoyed in-store service. Lynn and husband Marc have owned The Pet Place for 20 years, and the store’s fan are legion. (Just check out all of the enthusiastic support on Yelp.) And in the drive to “shop local,” you can’t get more hometown — Lynn and Marc are lifelong residents of Menlo Park.